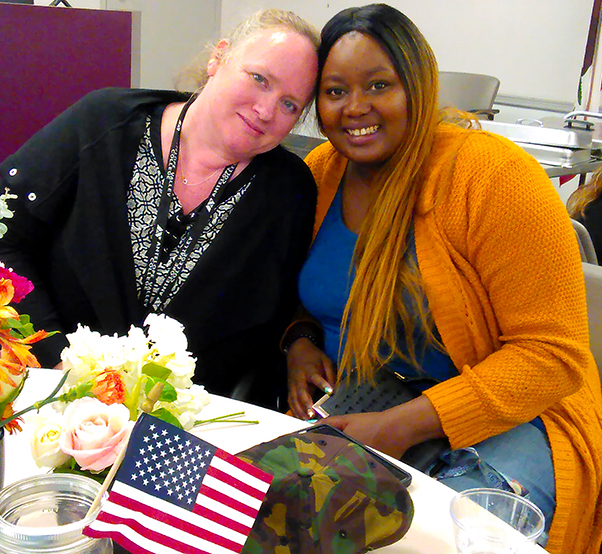 Michele Schottelkorb (left) and Tamiqua Jones attended the March 25 Women’s History Luncheon honoring female veterans at Antelope Valley College. Schottelkorb entered the military in 1992 and was stated at Fort Gordon, Ga., while Jones joined in 2010 and was stationed at Fort Leonard Wood, Mo. Some listened as bombs exploded not too far from camp sites overseas, while others carried out their duties at military bases situated on home turf, but the group of women veterans living in the Antelope Valley shared one common bond: a dedication to serving their country in war and peace. Their ages varied from young adults to those approaching menopause. The military branches where they enlisted were just as widespread — some Army, others Air Force. They enjoyed a camaraderie, a comfort zone, during a luncheon in their honor March 25 at the Antelope Valley College boardroom, where they spoke with great pride about their military experiences and how their personal worlds expanded through service to others. Ashley Johnson, the new program coordinator for the Veterans Resource Center at AV College, greeted the crowd of 49 attendees, a mix of veterans and their supporters. Johnson said she, too, is a veteran who served in the Army. “Women veterans are trail blazers,” said Krishna Flores, a veteran and the outreach specialist at the Antelope Valley Vet Center in Palmdale, a facility operating under the direction of the U.S. Department of Veterans Affairs. Flores said women served in America’s wars and conflicts throughout the nation’s history beginning with the Revolutionary War, although they were not formally under military command until the early 20th century. During the Civil War more than 400 women fought in the Union and Confederate armies, according to Flores. During World War I, roughly 35,000 women served as nurses and support staff. During World War II, some 140,000 women served in the U.S. Army and the Women’s Army Corps handling positions like military intelligence, cryptography and parachute rigging. 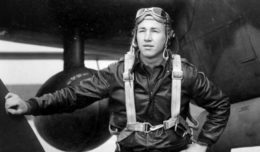 More than 1,000 women flew aircraft for the Women’s Airforce Service Pilots. In 1948, Congress passed the Women’s Armed Services Integration Act, granting women permanent status in the military and entitling them to veterans’ benefits. During the Vietnam War, 7,000 military women served in Southeast Asia. In 1976, the first women were admitted to America’s service academies — the Military Academy in West Point, N.Y., the Naval Academy in Annapolis, Md., and the Air Force Academy in Colorado Springs, Colo. During Operation Desert Shield/Desert Storm in 1991, more than 41,000 women were deployed to the combat zone. Flores provided more statistics, saying that these days more than 700,000 women have served in the military after the World Trade Center attack on 9/11. AV College President Ed Knudson stopped by to thank the veterans for their service and mention that he, too, is a veteran who served in the 1st Infantry Division and then the 4th Infantry Division. He encouraged the veterans to utilize the campus Resource Center. De’Nean Coleman-Carew, PhD., is a counselor who works with veterans at AV College. Like the speakers before her, she also has veteran status. She spent 3 ½ years on active duty as a member of the Air Force, stationed at March Air Force Base, Calif. She entered in 1983 working in administration, then signed on for four years in the Reserves as a mental health technician. While in the Reserves, she was called back into active duty for Desert Storm, again stationed at March. Veteran Louie Borrayo is part of the Outreach Team at Mental Health America of Los Angeles in the Palmdale office. He said his work focuses on helping the homeless or those at risk of becoming homeless. He said he engages with the Valley’s homeless population daily. The goal is to get those people, many of whom are veterans, into a dwelling they can call home. The agency provides the first month’s rent and in certain instances, as much as three month’s rent. The agency also assists with the start-up costs for utilities — gas and electric — plus other basics like dishes, etc. “The VA has given me the ability to be compensated for the stuff I’ve done,” Borrayo said. Army veteran Caitlin Murphy now lives in the Antelope Valley with her husband Derick Goebel, also a veteran and an Antelope Valley native. Murphy hails from Dallas, Texas, where she travels to visit her family. Murphy served in the military from 2011 to 2014. That’s where she met her husband at Fort Bragg, N.C. She worked as a human intelligence collector. In 2012 she was deployed to Afghanistan for 7 ½ months, where she heard the sounds of warfare.